The controversy that arose at Amherst College after it issued—and then withdrew—a politically correct “Common Language Guide” continues to reverberate across the Massachusetts campus weeks after its release. It is a living document and by no means a comprehensive list, but it is a good place for us to start. We understand that language around identity, privilege, oppression, and inclusion is always changing, evolving, and expanding. It does not represent an official position of the college or an expectation that everyone on campus should use any particular language or share a point of view. The goal was to help create greater awareness of the ways many people at Amherst and beyond understand their own identities. ANTI-BLACKNESS: Behaviors, attitudes, and practices of people and institutions that work to dehumanize black people in order to maintain white supremacy. Anti-blackness can also be internalized and might show up in black people or black communities in the form of colorism, an elevation of white culture, or attempts to separate oneself from black cultural norms. 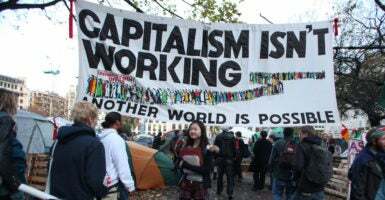 CAPITALISM: An economic and political system in which a country’s trade and industry are controlled by private owners for profit, rather than by the state. This system leads to exploitative labor practices, which affect marginalized groups disproportionately. MYTH OF SCARCITY: Used to pit people against each other, this is the fostering of the belief that resources are limited and the blaming of members of the marginalized group for using up too much of the limited resources available. However, the controversy did not end with the guide’s withdrawal from Amherst’s website. Some students and faculty were upset that the college decided to take it down. “Freedom of expression, research, and teaching has no relationship to the Common Language document … . Casting it in those terms is paranoid and diverts us from the real hard work of being a respectful community of difference,” Drabinski said. Jonathan Butcher, a senior policy analyst at the Center for Education Policy at The Heritage Foundation, took strong exception to Drabinski’s view of the controversy. Colleges need to return to the idea that it is not their responsibility to protect students from new ideas—something the University of Chicago has articulated so well in their position statements on free speech. Students need to learn how to have civil discussions, especially on hot-button issues. Their success in the future in the workplace and with friends and other relationships may depend on it. Amherst College did not respond to a request for comment. The original photo accompanying this article has been replaced since it showed University of Massachusetts at Amherst, not Amherst College.